Kids' cameras are not only a wonderful source of entertainment for children, but they can also help them build a number of skills and self-confidence. Here are a few of the options you may want to consider. 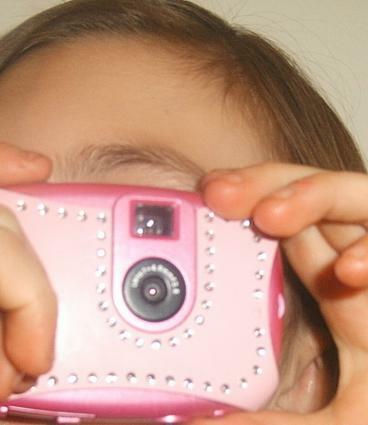 There are several types of kids' cameras available in today's media-happy marketplace. The most prevalent are certainly digital cameras. If you're worried about plunking down hundreds of dollars for a camera you're afraid your child will soon destroy, fear no more. You have several options if you are interested in getting a digital kids' camera. Mini or keychain digital cameras are another less expensive option. Much smaller than full-sized cameras, they are fun for little hands to hold. These do not usually contain preview screens either, however, and may not be built to withstand a child's inadvertent roughness. Hello Kitty Camera: Spectra. Approx. $50. Does not include preview screen. Kid Tough Digital Camera: Fisher Price. Approx $60 to $80. Includes preview screen and memory card. Pix-Click ($50) or Pix-Max ($80): Disney. Pix-max include LCD preview screen. Kids' Digital Camera: Sakar. Approx. $20. Does not include preview screen. The higher the mega pixels, the better the end photographs will be. Most children's cameras are under 3.0 mega pixels. Disposable cameras today are very inexpensive and perfect for use as a kids' camera. Many disposable cameras come in fun, bright colors, and even waterproof and digital versions, so you can give your little one the joy of photography without worrying about potential damage to a standard or digital camera. Polaroid has jazzed up the ancient instant camera with lots of fun new options kids are sure to love. In addition to the traditional instant camera, you can purchase the small-sized i-zone, wallet sized- Mio, and the digital Joycam. While these cameras have the added initial expense of purchasing the instant camera film, kids are sure to love to love the excitement of watching their photos shoot instantly out of their camera. Another route that can add up to considerable savings is to look at secondhand discount options in cameras. Auction sites like eBay and bargain sites like Overstock may offer more affordable options for purchasing a kids' camera you can afford for your little photographer.